Since then I have come to see that multiplicity is the key to all of Roy’s work: there’s a lot going on and Roy always wants to get it right. He’s also a public intellectual through his writing, editing, publishing, and teaching. A quick look at his bibliography suggests a seemingly impossible breadth and depth. 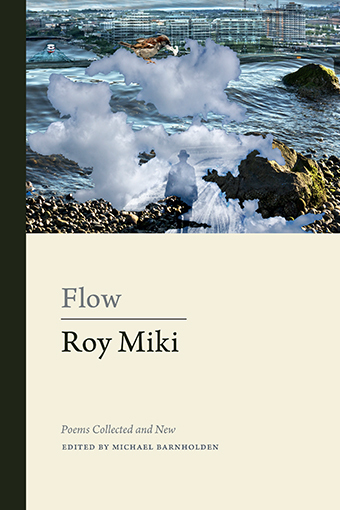 Sure, there is the poetry, but there is also the scholarly work on William Carlos Williams, bpNichol, Roy Kiyooka, and George Bowering, a couple of volumes on groundbreaking literary criticism, activist archival, and political work, even a children’s book written with his wife, Slavia Miki. And to those accomplishments we must add editor of Line magazine, later merging with West Coast Review to become West Coast Line, and publisher of a chapbook series, pomflit, with Irene Niechoda. And of course there is his long and storied career as a teacher. A list of students he has influenced, who have gone on to accomplish much with his help and guidance, would be lengthy. I consider myself lucky to have been among that company. Oh yes, and when he retired from teaching full-time, he taught himself digital collage technique. M: Those early poems in saving face are connected to scholarship because they have an archival component. You are looking at an archival document, your parent’s internment ID card, and the poem begins to compose in ten parts. Once you find that method of composition, it seems to me that your scholarly pursuits lead to your poetic pursuits. They inform your poetic pursuits in many ways. R: Yes, I’ve tried not to separate the two activities. Poetry as research and research for poetry have been mutual concerns. An obvious connection can be seen in the various poems I’ve written using found language from my archival research. Sometimes I’ve simply restructured some found text in poetic lines, as for instance, “higher learning,” albeit with the addition of a title. Other times I’ve inserted found texts in a poem.